Various dissident groups and news reports have recently claimed that there are covert nuclear sites in Burma, including reactors and uranium mines and mills.1 The evidence behind these claims is largely based on defectors or analysis of ground photos and overhead imagery of suspected sites. ISIS decided to test some of these claims, at least the ones where the actual site could be identified. Two sites were assessed and both appeared non-nuclear. This conclusion followed from a rather straightforward analysis of widely available imagery and relevant open source information. Many of the claims involve suspect sites without enough information to identify their exact location. ISIS could not evaluate these sites. To the extent that information about sites relies on defectors, it requires confirmation because defectors too often provide unreliable information. If the information is gathered from non-governmental debriefing processes, it can suffer from additional reliability and problems. Overall, the lack of specifics about many of the sites mentioned in the reports from opposition groups and defectors makes independent analysis using commercial satellite imagery very difficult. Those reporting the existence of secret nuclear sites in Burma should provide more direct and specific evidence, in addition to geographical coordinates, in order for some of the sites to be further investigated. ISIS does not want to overweigh the importance of debunking a few claims about secret nuclear activities in Burma. There remain valid suspicions about the existence of undeclared nuclear activities in Myanmar, particularly in the context of cooperation between Myanmar and North Korea. But the methods used in the public so far to allege secret nuclear facilities are flawed. Identification of suspect nuclear sites requires a more rigorous basis than is currently evident. ISIS assessed satellite imagery of two sites claimed to be a uranium mine and a mill in Burma, one of the few claims with enough specificity to allow it to be checked independently, and determined that the sites are not likely to be related to uranium mining and milling. This claim was first made in 2007 by DictatorWatch, a group promoting democracy in Burma and China, and later supported by Desmond Ball and Phil Thorton in an August 2009 Sydney Morning Herald report.2 The refinery, or mill, lies on the Myit Nge River 14.5 miles southeast of Mandalay and 17.7 miles northeast of Kyaukse, hereafter referred to as the Myit Nge Chaung site. The mine is located about 1.5 miles to the northwest of the refinery. The closest village is Ongyaw to the north of the mine (see Figure 1). Examination of the images and comparison to open source information makes it very unlikely that it is a uranium mining and refining operation. Figure 1: Google Earth image from August 29, 2009 showing the location of the Myit Nge Chaung facility, the associated mine, and the town of Ongyaw, Kyauk Mi. DictatorWatch claims that the Myit Nge Chaung facility is a uranium refinery. ISIS assesses that the Myit Nge Chaung refinery is a cement plant on the Mandalay to Pyin Oo Lwin road, National Highway 3 (see Figure 2). The plant is very large for any small clandestine uranium operation in Burma. The mill is also typical of a cement plant in several key ways. It has very large rotary kilns, which are used to roast the limestone feed materials to produce cement. This is not done for uranium but is done for many other metals and cement preparation. There is a large pile of coal or coal ash north of the plant, which is probably the fuel used in the rotary kilns. The site also has many vertical bulk silos. Silos are used for handling solid powders in industrial operations. 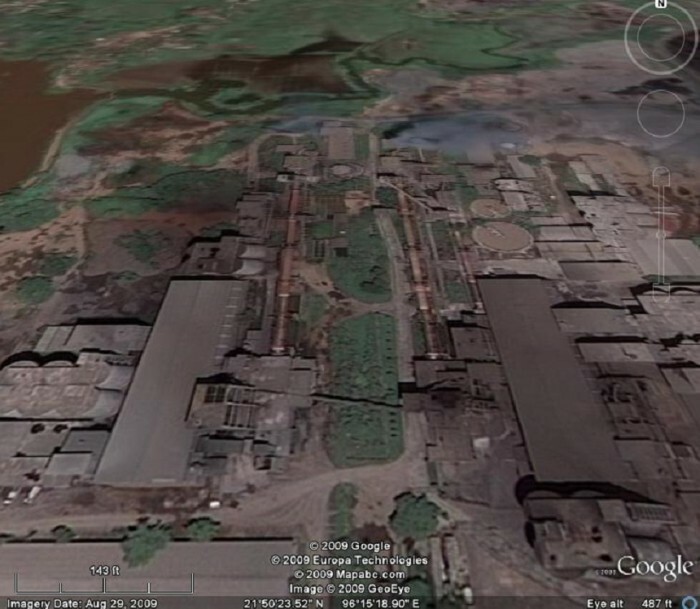 Figure 2: Close-up of Google Earth image of the Myit Nge Chaung facility from August 29, 2009. It shows distinctive characteristics of a cement plant. A uranium mill extracting uranium from rock ore would have many more signatures of liquid processing, such as crushers, thickeners, solvent extraction columns and a prominent liquid waste pond. These signatures are absent. Uranium can be extracted from phosphates in fertilizer operations. This is clearly not a phosphate fertilizer plant. p> In addition, the mill matches characteristics in a ground photograph of the AAA Cement Plant, also called the Triple A Cement Plant (see figure 3). Piping, structures, scaffolding and stacks appear in the same positions between the two pictures. Figure 3. 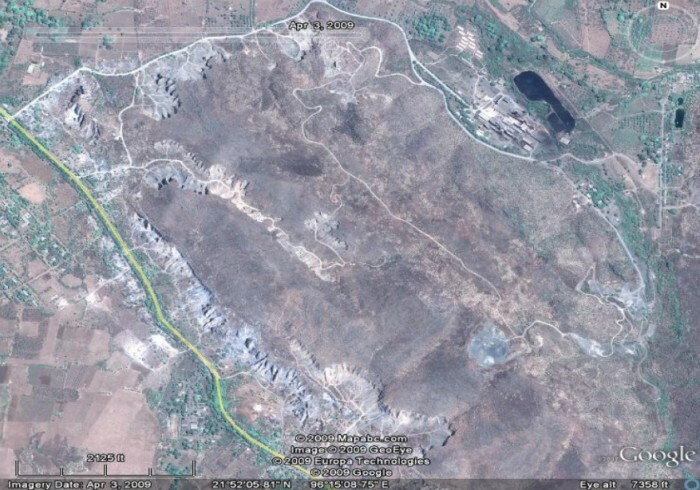 On the left, a ground photograph of the AAA Cement Plant in Myanmar.3 On the right, a GoogleEarth satellite image of the Myit Nge Chaung site. The location of stacks, piping and structures appear to correspond between the two images. ISIS also assesses that the mine north of the Myit Nge Chaung site is not likely a uranium mine (see Figure 4). It is not possible to conclusively identify the ores being mined from the overhead photo signatures. Nevertheless, the mine looks more like a quarry where bulk material is identified by its general characteristics and removed by diggers and buckets. The light colored material could easily be limestone. 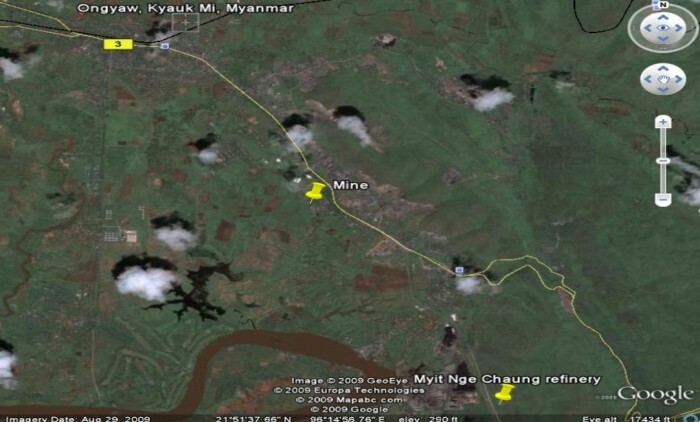 p> Figure 4: Google Earth image from April 3, 2009 showing the large mining operation 1.5 miles northwest of the Myit Nge Chaung site. p> The mountain where mining is taking place is apparently homogeneous and is being mined from all sides (see Figure 5). This has resulted in the mountain being scraped away piecemeal at all sides rather than by modern open pit mining techniques–which is one type of technique expected at a uranium mine. 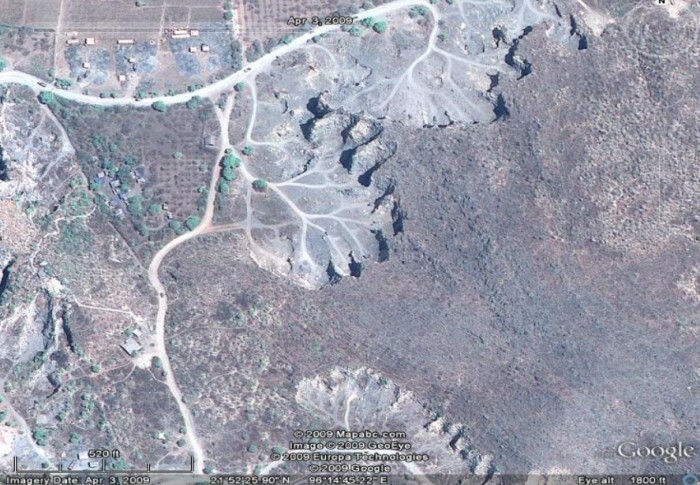 p> Figure 5: Google Earth close-up of the same area from April 3, 2009 showing the simplistic piecemeal mining technique not characteristic of uranium mining. 1See: Desmond Ball and Phil Thorton, “Burma’s Nuclear Secrets,” Sydney Morning Herald, August 1, 2009, http://www.smh.com.au/news/world/burma8217s-nuclear-secrets/2009/07/31/1248977197670.html?page=fullpage#contentSwap2 ; Bertil Lintner, “Tunnels, Guns and Kimchi: North Korea’s Quest for Dollars: Part 1, YaleGlobal Online, June 9, 2009, http://yaleglobal.yale.edu/content/NK-quest-for-dollars-part1; “Images of Suspected Uranium Mine and Refinery in Burma,” DictatorWatch.org, March 2007, http://www.dictatorwatch.org/phshows/burmafacility.html.